Welcome back to Tarleton Tip Thursdays, where every week we give you tips to help you harness the power of social media. If you are an avid follower of the TSMRI blog (and we certainly hope you are!) then you probably read last week's post: Social Media 101: Blogging for College Students. If this is your first visit to the TSMRI blog…Welcome! Be sure to check out the post above. It discusses how blogging can help your job search. 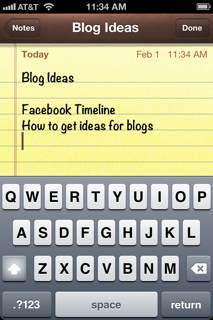 Now that we have you thinking about starting a blog, your next question may be “Where can I get ideas for my blog?” When I get an idea or I'm inspired by something I have read, I make a quick entry on my handy iPhone Note app. If I’m at my desk, I’ll grab some Post-Its. Later, when I have time and feeling more creative, I use these notes to start fleshing out my blog posts. Use whatever works best for you, but write the ideas down as they come. • Conversations you have with friends or business colleagues – Was there a particular topic that seemed to create discussion? This is a great opportunity to further develop the topic, share your thoughts and get feedback from your followers. • Things you hear people saying – Ever overhear conversations about your industry or field of interest and wished you could interrupt and set the record straight? Instead of jumping into someone else’s conversation, just take the topic to your blog and create your own conversation with your followers. • Random things – Ever have random thoughts or see something a little odd that totally surprised you? It’s amazing how different environments can trigger your imagination. What’s your favorite source of information? Share your ideas below. You never know whom you might inspire!